How is life in Auckland? I am doing great. I’ve 1 more week to go for my internship and then I will be traveling the south island, which I am very much looking forward to! As I know that not everyone of you will be able to make it to the Christmas party on Saturday, we have decided to have another PuB NiGHT as well on Thursday. Just having a couple of drinks and anyone is welcome to come and go as they please. For those of you that are new in Auckland, the PuB NiGHT is a great way to meet new people and you can exchange experiences with other interns here in Auckland. As it will be my last PuB NiGHT, it gives me the opportunity to say goodbye to all of you, in case I won’t see you anymore at the Christmas party. As usual we will start in Rakino’s and move over to Cassette later on. 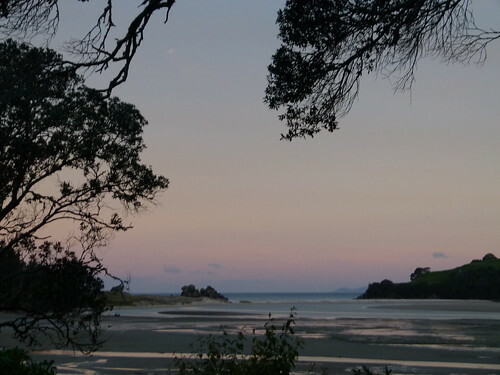 This entry was posted in INTERNeX, new zealand, PuB NiGHT and tagged auckland, Cassette, Christmas, goodbye, internship, island, night, Party, pub, rakinos on November 30, 2011 by ixlotte. This Thursday we celebrate the 15th INTERNeX New Zealand Pub Night ! And as usual now, we will begin at Rakino’s at 7:00pm. Lotte will not be there as she’s going to Wellington for the weekend, so I’ll be your only host for the night ! We have some people that arrived in the city and it would be great if everyone could meet each other and a have a bit of chat around a few bevvies. This entry was posted in INTERNeX, new zealand, PuB NiGHT and tagged auckland, bevvies, chat, drinks, entertainment, event, INTERNeX, meeting, new zealand, night, pub, PuB NiGHT, rakinos on November 14, 2011 by ixrobin. If you have pictures you want to share to everyone, don’t hesitate to send them to us at the address pr@internexnewzealand.com. 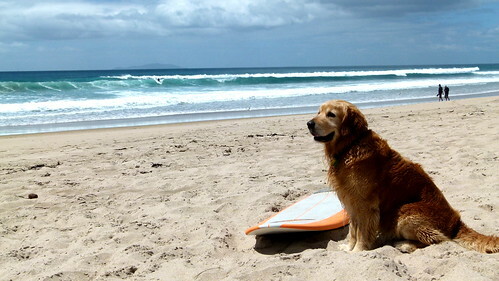 This entry was posted in INTERNeX, Picture of the Week and tagged board, dog, INTERNeX, new zealand, opoutere, picture, picture of the week, surf, wave, west coast on November 10, 2011 by ixrobin. MOJO Surf Weekend : I’ve lost my Mojo. 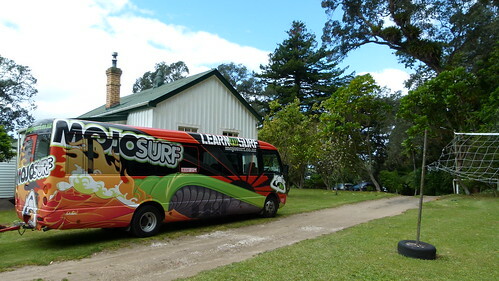 As some of you may know, we are back from a trip to Opoutere on the East Coast and Raglan on the West Coast where we have been surfing and enjoying the sun… well almost. We left Friday at 4:00PM in front of the Stray office on Fort St. for a three hours journey to Opoutere. 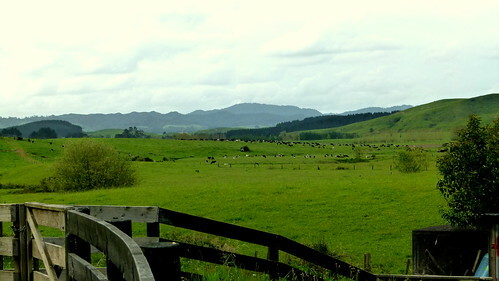 On the road you could clearly see the rural side of New Zealand, far from the buzzing of Auckland. 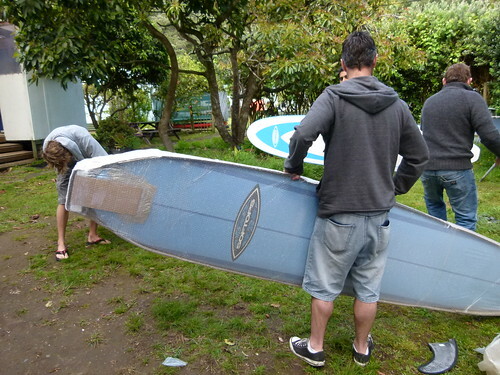 The morning after we took some time to unpack the new surfboards arrived earlier at the hostel and we took the mini-coach to get into the action. Arrived on the car park, and after a 10 minutes walk in a little pine forest, we arrived on the beach. 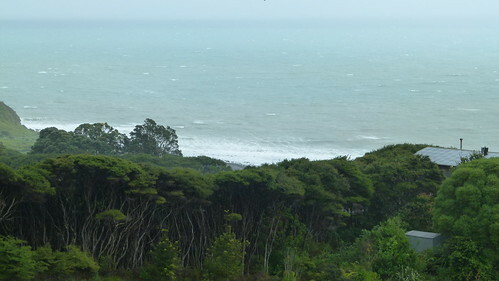 A long white sand beach surrounded by a forested reserve and a sand spit which is a breeding ground for several endangered species of sea birds like the “New Zealand Dotterel”. 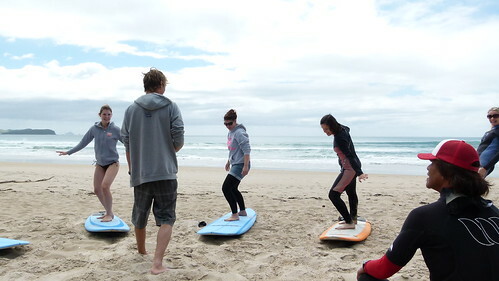 After the basics safety instructions given by our two Raglan-born instructors, Hemy and Ryan, we jumped into a quite warm water and took the first waves. Not easy to stand-up but most of us reached it finally after several times. Quite exhausting to battle against the current but the feel of the wave pushing you is really awesome. 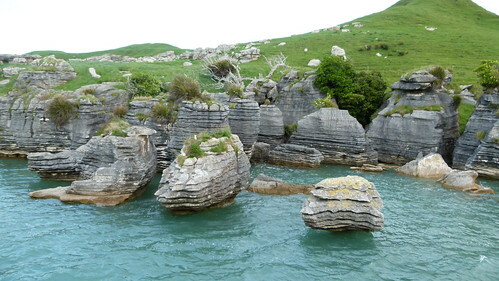 Another three hours journey and we arrive in Raglan to take the boat and have a scenic view of the harbour with the typical Pancake rocks. 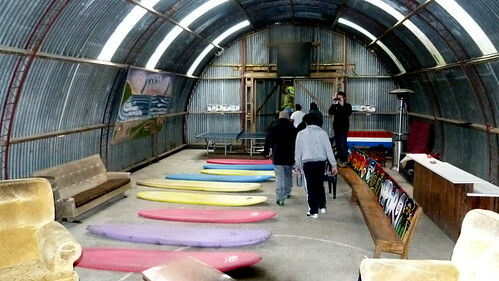 10 minute drive we arrived in Karioi Lodge, a backpackers hostel lost in the middle of the bush in Raglan heights. We arrived a bit too late to see the sunset this time but the next morning the sight was still pretty amazing even more from Inspiration point, a panorama point at just 5 minutes walking from the lodge where some come do their yoga on a wooden deck. 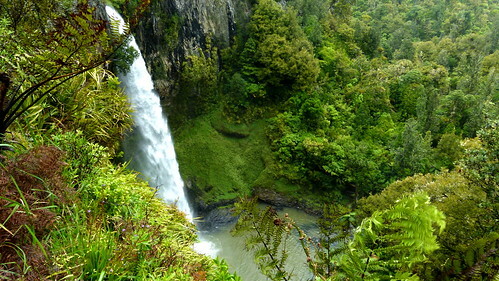 It was already the end of our stay in Raglan and we had to head back to Auckland, hopefully we had a stop in a wonderful and accessible place Bridal Veil Falls, 55m high. Thanks a lot to all the MOJO Surf crew for this awesome weekend, and even if I still can’t say that Keanu Reeves is an amateur, we had a lot of fun ! This entry was posted in INTERNeX, new zealand, Travel and tagged beach, bridal veil falls, dotterel, east coast, karioi lodge, mojo, new zealand, ocean, opoutere, pancake rocks, raglan, surf, wave, west coast on November 7, 2011 by ixrobin. I just wanted to tell you that I am going with Robin and another girl to the Bay of Islands and Cape Reinga next weekend. We will be leaving on Friday (11th of November) morning, stopping in Whangarei and Goat Island before going to Paihia where we would like to do some dolphin swimming and snorkeling (if the weather allows that). The next day we will go to ninety mile beach where you can do sanddune surfing and in Cape Reinga we can see the Pacific Ocean and the Tasman Sea come together. 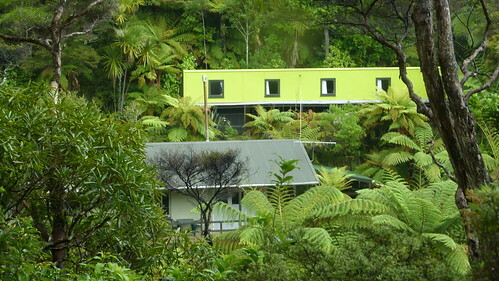 On Sunday the 13th we will have some time to spend in Paihia and then we’ll head back to Auckland. If a visit to the Bay of Islands and Cape Reiga is still on your must-do list and you feel like joining us, just let me know! The more the merrier we think! This entry was posted in INTERNeX, new zealand, Travel and tagged auckland, bay of islands, cape reinga, dolphins, merrier, Pacific Ocean, snorkeling, tasman Sea, trip, weekend, Whangarei on November 2, 2011 by ixlotte. 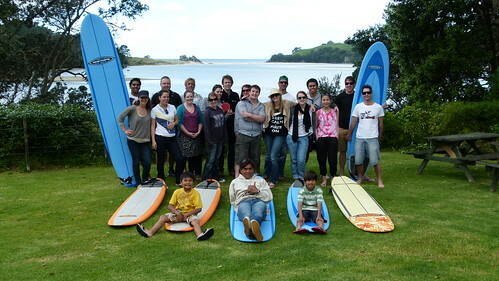 The picture has been taken on Waiheke island just before I assisted in a sheep shearing which was awesome. Don’t hesitate to send us your pictures, either they are beautiful, funny, strange or whatever you find cool and the chosen one will be offered a beer or a glass of wine at the next Pub Night ! 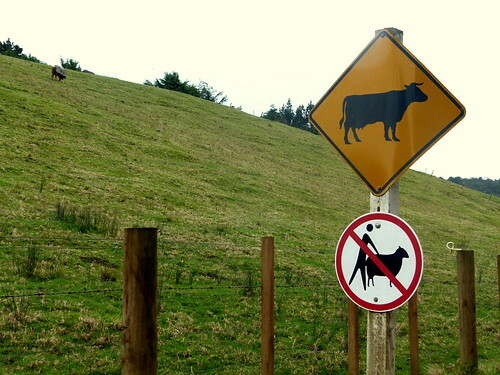 This entry was posted in INTERNeX, new zealand, Picture of the Week and tagged beautiful, funny, island, new zealand, picture, PuB NiGHT, shearing, sheep, strange, waiheke, waiheke island, week on November 2, 2011 by ixrobin.